My guide to Seminyak Bali, including the best places to stay, eat, visit and have fun. Seminyak is the next town north of Legian and Kuta located on the west coast of Bali, it is generally the more upmarket area with mostly luxury accommodation and high-end restaurants and bars, but believe me you can still find a bargain. The Seminyak area is more sophisticated and laid back than the Kuta area which is best known for its parties, bars, clubs and night life. This area is also know for its enormous variety of accommodation, from beach side bungalows to luxury hotels and private villas. Be sure to catch the legendary sunsets and the Balinese ceremonies on the beach. 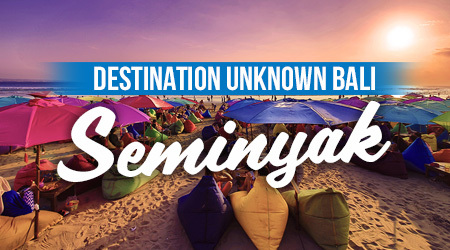 Seminyak is where you will find Balis largest expat community and amenities cater to their needs. It is undeniably more expensive than Kuta, but you will notice the step up in quality as well. Peak travel: Jun–Sep & mid-Dec to early Jan. Climate: warm & tropical year-round, with a rainy season Oct–Mar. Travelers typically stay 4–9 days. Click here to learn the best time for you to come to Bali. Most of Seminyak can be covered on foot if you are not in a hurry, but taxis are plentiful as are motorbike rental outlets. Expect to pay Rp 50,000 to 80,000 per day for renting a motorbike. Ngurah Rai International Airport, The airport is located south of Legian and a taxi or car journey from there will take about will take about 20 minutes. Metered taxis (taksi berargo) are ubiquitous on the streets of Seminyak and are a relatively cheap and reliable way to get around, especially at night. Avoid any taxi where the driver refuses to put the meter on. Seminyak is part of the main west coast conurbation in South Bali and it can get very congested with traffic. There are two main routes in. From Kuta and Legian, Jalan Legian runs parallel with the beach and at its western limit, becomes Jalan Seminyak. If at all possible try to avoid this road though, and take instead the eastern bypass called Jalan Sunset. This is almost invariably the quicker route from Kuta and Legian into Seminyak, although it is actually further in distance. Seminyak is connected by bus routes from all areas of Bali. There are various scheduled shuttle services including Perama. Perama shuttle buses to Kuta leave from Sanur, Ubud, Candidasa, Padang Bai and Lovina. There are so many hotels, resorts and places to stay in Seminyak its hard to know which one to choose. So I have put together a list of places I have personally stayed and rated them according to my experience. I’ll let you know the good, bad, great and ugly side of all these hotels that you probably wont find on any other accommodation booking site. There are virtually no backpacker accommodation in Seminyak. Budget travellers will generally do better to stay in nearby Kuta or Legian. Looking for some where to drink and party. Here are some of the best party locations in Seminyak. With so many things to see and do, here are some of my top things to do in Seminyak.